This attractive 100ml perfume diffuser fills your home with the true-to-life fragrance of sun-ripened figs. The evocative scent is warm, sweet, and slightly earthy, evoking happy memories of long summer afternoons, delicious fruits, fresh linen, and home-cooked wares. A captivating aroma with a luxe feel, sublime and indulgent, suggestive, and above all addictive—you’ll fall in love with this alluring scent and quickly associate it with your happiest memories. Plato, one of the world’s best-known philosophers, thought that figs stimulated intelligence, earning them the nickname ‘the Philosopher’s fruit’. While there might not be too much scientific evidence to support his theory, figs certainly do have a number of more widely-accepted benefits. This popular scent is thought to aid relaxation, encourage good sleep, and generally heal the body, mind, and emotions. It is not difficult to imagine how the wonderfully-uplifting aroma of sweet figs can immediately brighten your mood and improve your outlook. Our Fig Diffuser uses the purest essential oil in an alcohol-free base, sourced from specialist suppliers around the world, and is free from chemicals and toxins. 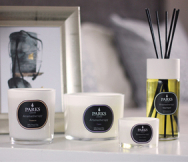 Unlike commercial air fresheners that include potentially harmful ingredients, our diffusers are completely natural, using only trusted ingredients that have been expertly blended by our skilled Perfumer. This thoughtfully-styled diffuser has a light-coloured top and uses natural rattan diffuser sticks to allow the wonderful fig fragrance to disperse beautifully around your home. Packaged in a stylish container, our Fig Diffuser is the perfect present for a discerning friend or loved one.